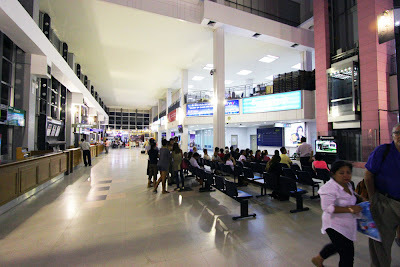 Vientiane's international airport has an comfortable, old world charm which no longer exist in other busy airports around the region. 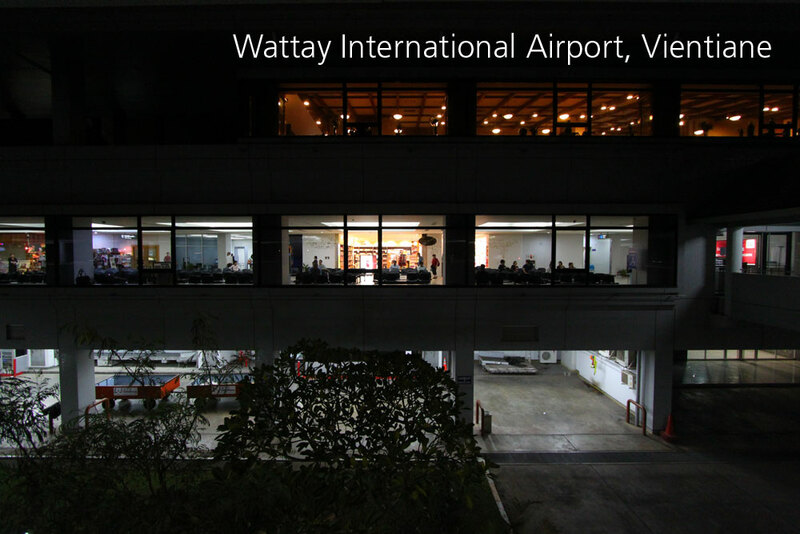 Wattay International Airport is a relatively new airport serving Vientiane. 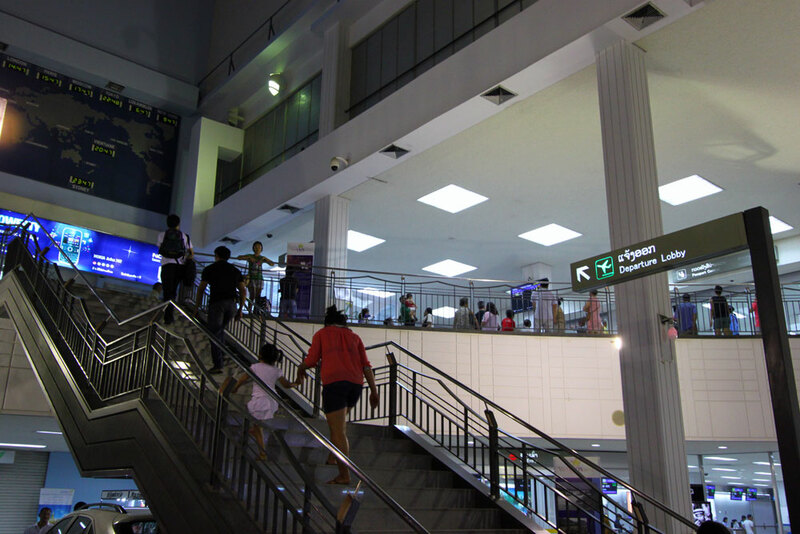 Built with support from the Japanese development agencies, it is an international airport atypical of what you would normally find in the region. 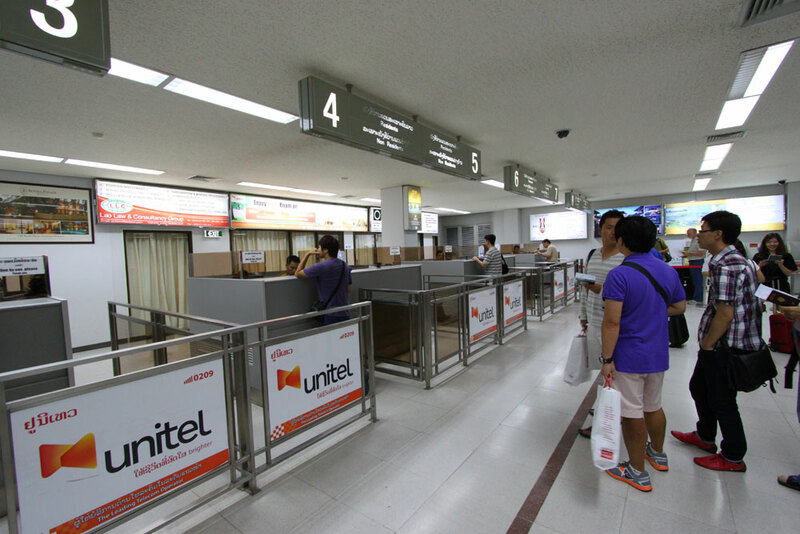 The arrival hall, flanked by a row of car rental desks, with the departure hall being immediately behind this picture. 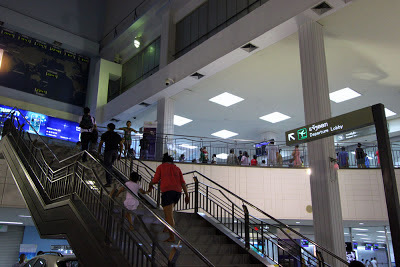 For starters, the airport is only located 3 km from the city centre, making it one of the few modern airports still easily accessible by city dwellers. 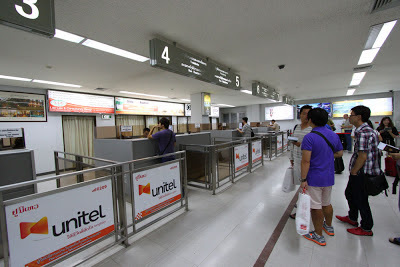 Arriving too early is not recommended here, as even if you can check in, the immigration counters do not open until around 20-30 minutes before a flight's boarding time. Entire families will often turn up to see off their brother, daughter or relative, and there will often be a large crowd hanging in front of the immigration doors. Perhaps air travel is still considered a luxury in a country where the vast majority of the populace are still subsistence farmers. You may even enjoy the immigration experience here. The immigration officers are, unlike their overworked counterparts in most other countries, quite friendly and will often have a chat with you. They are also one the neatest immigration officers around, and will take the time to make sure the stamp is aligned with the grid on your passport page, without overlapping any other stamps. For me, entering the airport is nostalgic as the aroma that pervades the immigration area takes me back to Hong Kong in the late 1980s and 90s. Security is also surprisingly lax. On my most recent visit, Japanese tourists were busy waiting in line while taking photographs and videoing their trip. In most other countries, just even taking out a camera would involve a visit to a small white room with bright lights. Waiting until Christmas to unpack the new plane? The tarmac on most days is completely empty, save for maybe one or two parked planes waiting for their next turn to fly. 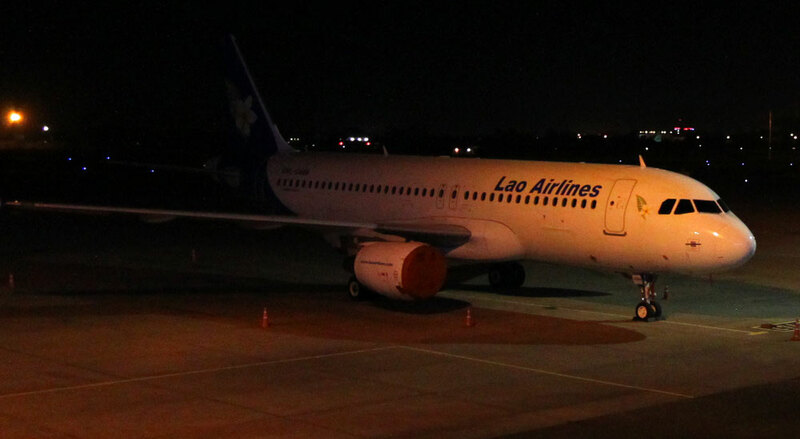 When I arrived earlier on last month, I saw a new plane, still waiting to be unpacked. It is part of Laos modernization drive, and Lao Airlines is no exception, putting in orders for two Airbus 320s in a bid to modernise and increase the size of their fleet. There is a restaurant named the West Coast Buffet, with a retro logo which would not be out of place in front of a 1970s American airport. 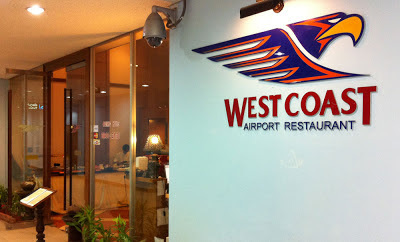 The restaurant overlooks the airport and its runway, and the locals seem to like to come and watch the few flights take off during the day. 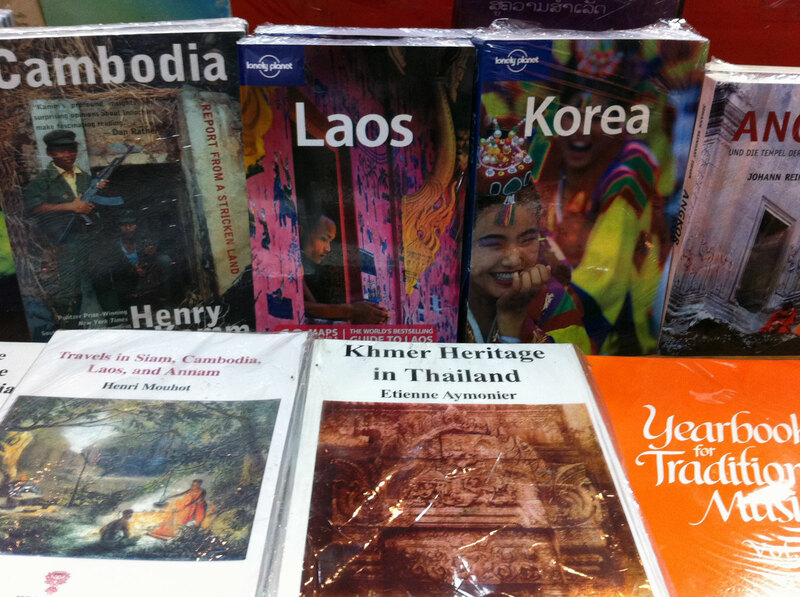 Out of the few shops at the airport, the largest one is on the second floor and sells a whole range of trinkets, including, interestingly enough, pirated copies of the Lonely Planet. While at first glance its fakeness is not obvious, a closer look will reveal a colour printed cover with photocopied pages. To their credit, the size of the guidebook does not seem to be significantly thicker than the original one, and it may prove to save a few dollars for the average tourist, provided the book doesn't fall apart first. Stepping into Vientiane's premier airport is sometimes like stepping back into time, but in a good way, into an era where travel was still relaxed and had a sense of dignity. It may not be the shiniest biggest or most highly ranked airport, but it does enthuse with a charm of yesteryear, and needs to be experienced to be understood.